Invacare® HTR Tilt & Recline Wheelchair is loaded with features such as tilt and recline capabilities, smooth and effortless operation and optimal positioning. In addition to these features they offer maximum safety for patients and caregivers. This is a combination of the most advanced features of the Invacare A4 and many revolutionary new design features. 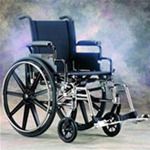 Carbon steel is used so its easy to maintain and durable.Overall a good and dependable wheelchair. A good quality wheelchair with padded upholstery, swing away leg rests which helps in tight corners. A good and sturdy wheelchair. Imagine the ultimate ride. The "Boing!" with its four wheel independent suspension, can turn your dream into reality. A chair that softens the hardest terrain, the "Boing!" offers the smoothest most comfortable ride possible. Colours 'N Motion "Spazz" offers you the style, versatility and adjustability you need in your first wheelchair. With its simple design and clean lines not only will you look good in your "Spazz" but your maneuverability will be unsurpassed. There are so many things that are adjustable about this wheelchair that's what makes this product great. Its to heavy for travailing. Easy and great to use outdoors, had 10 different adjustments to fit any person. Its lightweight with a padded seat for comfort and can elevate your leg for calf, thigh or foot support. This chair has options for seat width, its durable and lightweight. Available color: Blue, Silver, Chrome.